Honestly, I'm sick and tired of seeing this pose of Mega Man. It's on a t-shirt, it's.......everywhere. Not original at all. It's even more plain than the R20 English versions. Let's not forget this book contains BOTH Classic AND X series......why you always abuse X, Capcom? yaaaay, i will bought it! X is usually on the back cover. Man, that is so... boring and empty. They completely sucked the life out of the cover. And why is only classic Mega Man on the cover? Lame. Wow... ugly cover! Capcom of USA is really lazy.. REALLY LAZY!! They just want your money! I'm just sick of seeing the 8bit MM sprites as a whole. They're more overused and recycled than every single sprite collection in CvS2, MvC2 and CFJ combined. Clearly, the new cover removed all the background images in order to rewrite Megaman's history. "Games? Megaman was never about video games! Now stop complaining/whining/bitching and go out and buy all the merchandise!" I still like the iconic jump sprite, but I must agree with everyone else. This is definitely the worst place to put it. 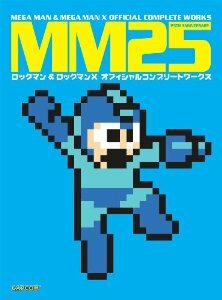 If someone isn't a Megaman fan sees this book, is this cover going to grab their interest? No! No wonder Capcom doesn't think Megaman is popular in the US. 100 new pages according to Amazon. Going to get this, I hope it doesn't let me down. And here I thought the Japanese cover was way simple... Udon will burn the blue from their printers faster than Hyenard. Well, at least it's 2 books in 1 + 100 pages in Engrish.